Tell your friends that you’re heading to Dubai. Chances are, they’re picturing a hot, expansive desert. They may even tell you to bring your own water. Now, your friends aren’t wrong (aside from the water part)–they’re just talking about one aspect of Dubai’s weather. It’s true, Dubai is a tropical, desert climate, so it’s not uncommon to see temperatures around 41 degrees Celsius (105 degrees Fahrenheit) in the summer. But Dubai is a large city with plenty of moderating influences (like seasons and geography). As a result, Dubai’s climate is more complicated than you might think. Dubai is well-adapted to its desert climate; as such, air conditioning is not optional. Everything from middle-class homes (yes, these do exist) to high-end shopping malls constantly pump in fresh, recirculated air to keep everyone happy. Just like in Siberia, where heating is a necessity, not a luxury, air conditioning is the lifeblood of Dubai. Without it, this futuristic city wouldn’t be possible. In fact, Dubai’s is currently planning the Mall of the World, a massive, temperature controlled indoor city–the first of its kind. Designed to be environmentally sustainable, the Mall of the World will encompass 3 million square feet (300,000 square meters) of health care, apartments, entertainment, and retail. This innovation could be the first step of a post-air conditioning world where we leave a much smaller carbon footprint. Believe it or not, Dubai does have seasons. They’re not as profound as New York or Chicago, but there are significant differences between summer and winter. In summer (from late May through early September) temperatures get quite high, ranging from 41-50 degrees Celsius (104-122 degrees Fahrenheit). For this reason, crowds often thin out during the summer, even though air conditioning is plentiful and inexpensive. However, one upside of a summer vacation in Dubai is the price: room rates drop substantially outside the winter season. During Dubai’s winter (from November through April), temperatures are much more agreeable. At this time, they range from 15-26 degrees Celsius (65-80 degrees Fahrenheit), the default range for most air conditioners. Also during this time, Dubai actually gets rain, with the rainiest month being in February (average of 35 mm). Usually, it comes with a thick, cooling fog and a light drizzle. Winter is high season, offering the ideal temperature for beachgoers and most travelers. During this time, Jumeirah sees an eclectic mix of watersport aficionados, tanners, families, and friends. The last piece of the puzzle is Dubai’s geography. Because it’s so expansive, Dubai is split up into three types of terrain: coast, desert, and mountain. 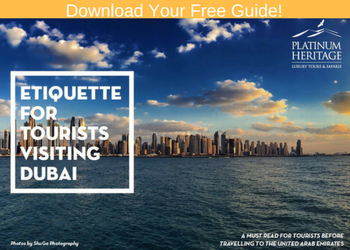 The coast includes areas like Jumeirah, Deira, and more generally, the waterfront along the Persian Gulf and Dubai Creek. Though the ocean is often seen as a moderating influence on extreme temperatures, this isn’t the case in Dubai. If anything, the coast is more humid, heavy, and hot in the summers, which can make the beach that much more enjoyable. The next region is the mountains, specifically the Al Hajar Mountains that lie between Dubai and the neighboring Sultanate of Oman. Herds of goats, camels, and donkeys patrol this overgrazed terrain, known for its endangered wildlife and scenic vistas. Between the mountains and the coast, however, lies the desert–perhaps the best place to go if you’re sensitive to high temperatures. The desert is often 7-10 degrees cooler than the city limits in the evenings, and much less humid than the coast. Rainfall is (unsurprisingly) scarce in the desert, making for a dry heat that is much more bearable than the oppressive humidity of the coast. This area is where Platinum Heritage runs our safaris, in the vast deserts sandwiched between urban Dubai city and green Al Ain. We take every effort to ensure guest comfort, especially in the face of high (and low) temperatures. Enjoy desert safaris in comfortable temperatures all year around. Thinking of stopping over in Dubai? 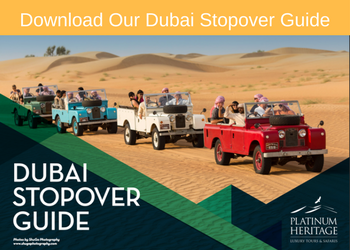 Read our full Dubai Stopover Guide.